Right Way to Eat! : File This Under "Weird Themes"
I just ate a hearty meal of Pizza Hut's pasta for lunch. Nothing special, but it was worth eating. 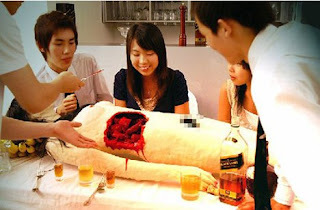 In a very surreal instance and unlucky chance, I stumbled upon a site that has 15 of the most weirdest themed restaurants. Two of them grossed me out immediately. There is one with a Taiwanese restaurant with a restroom theme and using a toilet bowl seat as your chair, while another Japanese restaurant had a cannibalistic theme of using a disemboweled body as your "deboned" protein meal. If you want to check out this site, go to Weburbanist for more of these interesting dining options around the world. As for me, I'll have to get started on my Urasawa and La Casita Mexicana reviews so that I can be reminded on how good food don't need offbeat themes to attract people into the restaurants. 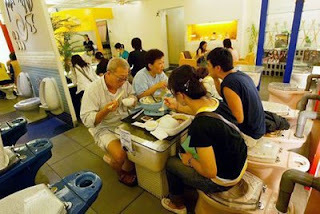 I've actually been to that "toilet" themed restaurant in TW. It's called "Benh Suh," and it's pretty popular with the younger folks as I took my little cousin for her birthday per her request. The food is meh, but the whole idea is pretty cool. I wish I took food pics back then, as the shaved ice was served in an Asian styled Toilet Hole (Hope you know what I mean by that), with some chocolate ice cream poop to make the whole experience complete. The table was a bathtub with a big glass on top of it. Interesting gimmic yes, would I go back? No. Ewww...I don't know if I want to pay for a chocolate dessert to look like poo. This whole toilet scenes was too much for me to stomach. It's just too kooky for me. And I wouldn't step inside of an overprice diner with a weird gimmick. yeah, it was a WTF moment for me. You could have gone to KFC for their special blended herbs and spices for the chicken. Western Food in TW? Tough call, but I do think Micky D and Pizza Hut would be the most closely resembled to their Western cousins.